Through their lifestyle program of therapy workshops, the Blue Mountains aged care home introduced a series of reminiscence activities resulting in a recipe book, Pinches & Handfuls. 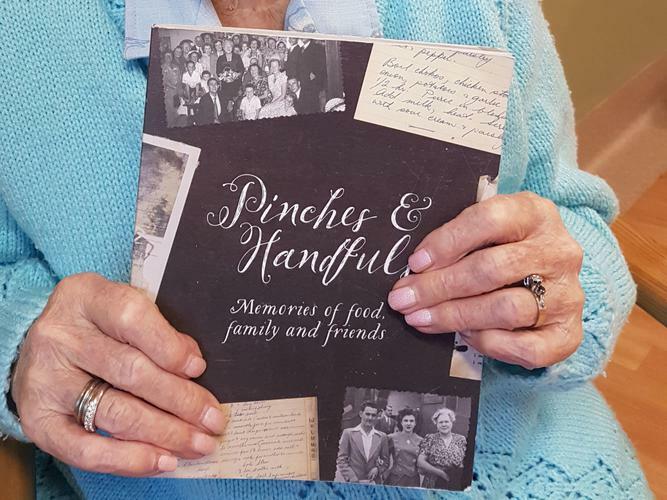 The inspiration for Pinches & Handfuls came from a conversation between Endeavour Lifestyle Coordinator Kaelene Masters and 91-year-old resident, Johanna, who spoke about her memories as a young girl cooking with her mother in Germany. As Johanna described the aromas and textures of the food and feelings she experienced 85 years ago, the conversation sparked the idea to create the cookbook which celebrates food, family and friends. Exploring concepts of identity and life experiences, the book writing process and cookery workshops were conducted alongside reminiscence therapy. “I have heard stories from residents that have lived all over the world from Africa to Siberia, residents who have worked as nurses, farmers, art curators, housewives, teachers, pianists and pharmacists, and residents who witnessed the Holocaust, Nelson Mandela's imprisonment and children of the stolen generation,” Ms Masters says. Endeavour General Manager, Mary Lomnicki, says the 106-page recipe book captures residents’ lives before they came to Endeavour Home. “Recipes turned up on tiny bits of paper, in bibles and address books, or long lost recipes were transcribed from residents’ memories, writing down the pinches, handfuls and touches of this and splashes of that,” she says. Pinches & Handfuls includes a range of recipes from biscuits, cakes and slices to dinners and puddings. To purchase a copy, call Opal Endeavour on 02 4754 6000. All proceeds will be donated to Dementia Australia.